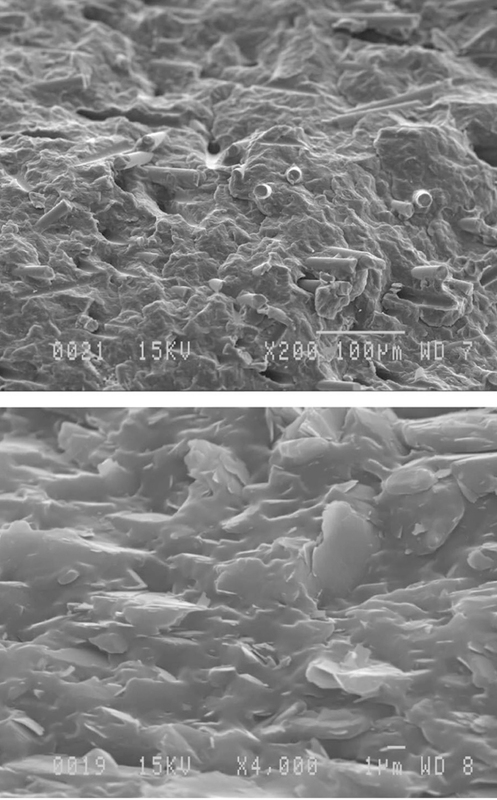 Figure 1: Typical morphology of impact-modified composites—polypropylene (PP) with recycled rubber and maleated polypropylene (MAPP) coupling agent—reinforced with 30% glass fibers (above) and talc (below). Figure 2: Impact strength of 30%-filled composites—PP with MAPP coupling agent and 15 or 25% ethylene propylene diene monomer (EDPM) or ground tire rubber (GTR), as indicated. Reinforcement is glass, talc, or hemp, as shown. Figure 3: Tensile modulus of 30% filled composites—polypropylene with maleated polypropylene coupling agent and 15 or 25% EDPM or ground tire rubber (GTR), as indicated. Reinforcement is glass, talc, or hemp, as shown. Polymer composites based on different types of matrices and reinforcements can be found everywhere. Although their mechanical properties (modulus and strength) can be substantially increased with careful selection of particle type and concentration, limited use in industrial applications can be related to brittleness and lower impact resistance, compared to the neat matrix. Several methods have been reported to improve impact strength, but introduction of an elastomer phase is usually the most effective. To this end, ethylene propylene diene monomer (EPDM), natural rubber (NR), and styrene-ethylene-butylene-styrene tri-block copolymer (SEBS) have been used.1-3 But adding a virgin rubber reduces the modulus and strength, as well as raising raw material and processing costs (if dynamic vulcanization of the elastomer phase is needed). Maleated polyolefins (coupling agents) can create strong interaction between waste rubbers and thermoplastic resins.7 For example, thermoplastic elastomers with ground tire rubber (GTR) contents of 70 and 90 wt% have been produced with tensile elongations at break of 431 and 219 percent, respectively. To be effective, the coupling agent must be located at the interface and not distributed in the matrix. To enable this, a two-step extrusion process was developed. In the first step, the coupling agent (maleated polymer) and the waste rubber crumbs are compounded together to produce surface-covered rubber particles. (High compatibility between the maleated polymer and waste rubber is related to chemical bonds created between the maleic anhydride groups and unsaturated carbons on the rubber surface.8,9) In the second step, the compound produced in step one is introduced into the main feeder of a twin-screw extruder with the polymer matrix, and the reinforcement is added downstream through a side-stuffer. In our investigations, we produced composites based on polypropylene (PP) using different types of reinforcement (hemp, glass, and talc) and maleated polypropylene (MAPP) as the coupling agent.10 The compounded material from the two-step procedure described above was pelletized to be compression molded into rectangular plates for morphological, mechanical, physical, and thermal characterizations. Figure 1 presents the morphological state after cryogenic fracture. It is clear that good particle distribution is obtained. Furthermore, no rubber particle (around 300 microns in size) can be seen on the surfaces, indicating that good [particle] surface coverage was obtained. Another advantage of this technique is the possibility that the coupling agent (MAPP) improves adhesion between the reinforcing particles and the compound serving as the matrix (PP + MAPP + GTR). No particle pull-out was observed, and the fracture occurred within the particles (Figure 1). Figure 2 presents the impact strength of selected samples. As expected, reinforcement addition leads to significantly decreased (44%) notched impact strength since dispersed particles are known to act as stress-concentrators. But impact strength was considerably enhanced for all composites after surface-treated rubber wastes were added. For example, adding 15% MAPP/recycled EPDM increased the impact strength of PP + 30% glass fiber composites by more than 80%. 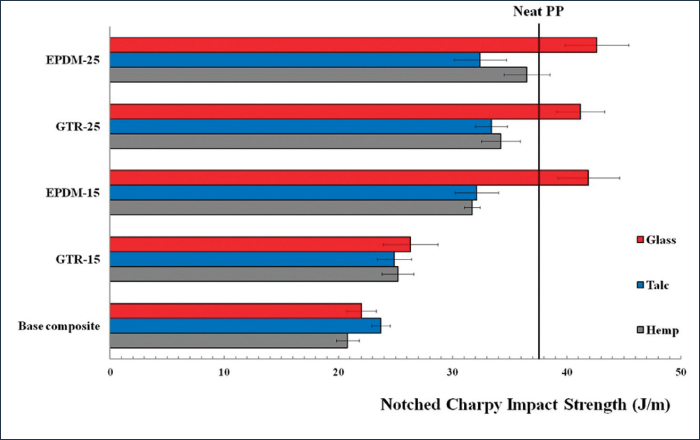 In another case, adding 25% of MAPP/GTR blend increased the impact strength of PP-glass composites by more than 78%. Finally, we found that since rubber waste is already vulcanized, adding recycled rubber did not substantially reduce the composites’ tensile modulus (see Figure 3). 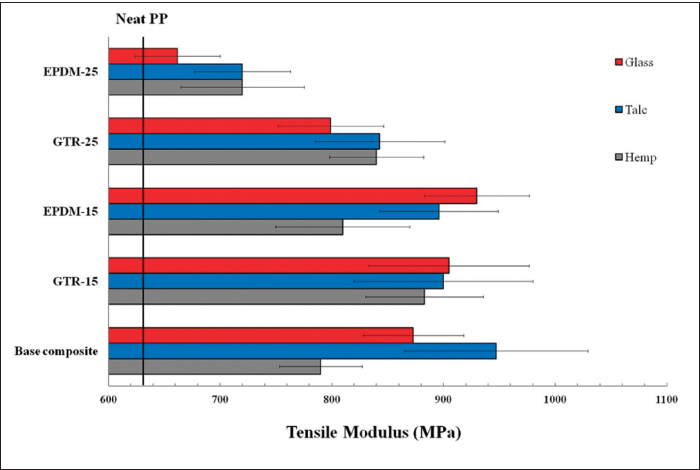 The results of Figures 2 and 3 clearly show that sample EPDM-15 has a much higher tensile modulus than the neat PP matrix while still having higher impact strength. In summary, we successfully performed impact modification of polymer composites using waste rubbers. Our results indicate that the composition of the materials, as well as the processing, influences the final properties of the composite. We carefully selected the processing steps and the order in which the components were introduced in a mixing strategy. Nevertheless, we are now undertaking more work to improve on these results for other matrix-reinforcement/rubber-phase combinations, as well as to optimize the processing conditions in terms of flow rate, temperature profile, and screw design. This is necessary to fully understand the effect of a material’s thermomechanical history on the final morphology of these compounds. This is particularly complex with recycled materials, in which contamination and composition variations are always present. K. Oksman and C. Clemons, Mechanical properties and morphology of impact modified polypropylene-wood flour composites, J. Appl. Polym. Sci. 67, pp. 1503-1513, 1998. C. Clemons, Elastomer modified polypropylene-polyethylene blends as matrices for wood flour-plastic composites, Composites Part A 41, pp. 1559-1569, 2010. A. K. Rana, A. Mandal, and S. Bandyopadhyay, Short jute fiber reinforced polypropylene composites: effect of compatibiliser, impact modifier and fiber loading, Compos. Sci. Technol. 63, pp. 801-806, 2003. P. Punnarak, S. Tantayanon, and V. Tangpasuthadol, Dynamic vulcanization of reclaimed tire rubber and high density polyethylene blends, Polym. Degrad. Stabil. 91, pp. 3456-3462, 2006. S. L. Zhang, Z. X. Zhang, Z. X. Xin, K. Pal, and J. K. Kim, Prediction of mechanical properties of polypropylene/waste ground rubber tire powder treated by bitumen composites via uniform design and artificial neural networks, Mat. Des. 31, pp. 1900-1905, 2010. C. R. Kumar, I. Fuhrmann, and J. Karger-Kocsis, LDPE-based thermoplastic elastomers containing ground tire rubber with and without dynamic curing, Polym. Degrad. Stabil. 76, pp. 137-144, 2002. A. Ramezani Kakroodi and D. Rodrigue, Highly filled thermoplastic elastomers from ground tire rubber, maleated polyethylene and high density polyethylene, Plast. Rubber Compos. Macromol. Eng. 42(3), pp. 115-122, 2013. A. R. Tripathy, J. E. Morin, D. E. Williams, S. J. Eyles, and R. J. Farris, A novel approach to improving the mechanical properties in recycled vulcanized natural rubber and its mechanism, Macromolecules 35, pp. 4616-4627, 2002. M. R. Abadchi, A. J. Arani, and H. Nazockdast, Partial replacement of NR by GTR in thermoplastic elastomer based on LLDPE/NR through using reactive blending: its effect on morphology, rheological and mechanical properties, J. Appl. Polym. Sci. 115, pp. 2416-2422, 2010. A. Ramezani Kakroodi and D. Rodrigue, Impact modification of polypropylene based composites using surface coated waste rubber crumbs, Polym. Compos., 2014 (in press, doi:10.1002/ pc.22651). Adel Ramezani Kakroodi, Faculty of Forestry, University of Toronto, received his PhD in chemical engineering from Université Laval, Canada, and is currently a postdoctoral fellow. His research is focused on, but not limited to, processing and enhancement of polymeric composites and blends. Denis Rodrigue, Université Laval, received his PhD in chemical engineering from Université de Sherbrooke, Canada. He is currently a professor of chemical engineering, and his main research areas are in polymer processing and characterization, especially for complex multiphase systems like composites, foams, and blends. This paper was first published in SPE Plastics Research Online as paper 10.2417/spepro.005363; for other articles on plastics research, check out www.4spepro.org.